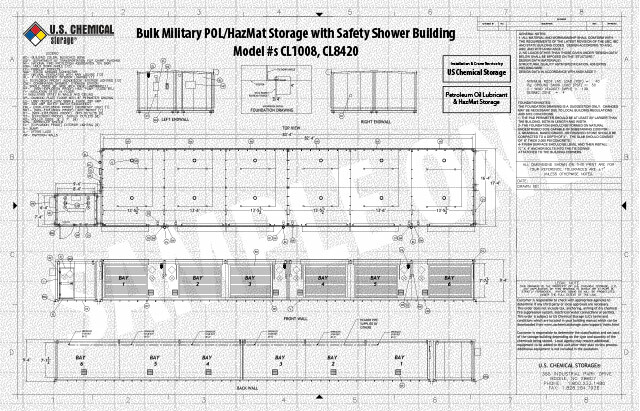 Duplex Chemical Storage Buildings offer countless benefits for those with a large amount of hazardous material to manage. Maximizing the limited square footage you have, and storing chemicals closer to your facility will increase efficiency at each step of the manufacturing process. 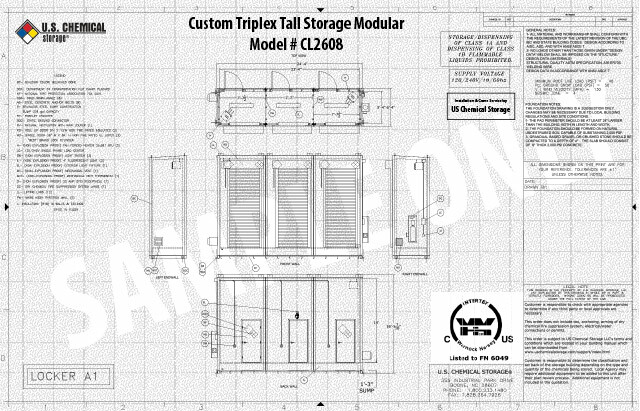 Our 100% customizable duplex storage modulars multiply your choices when smaller buildings are simply not an option. 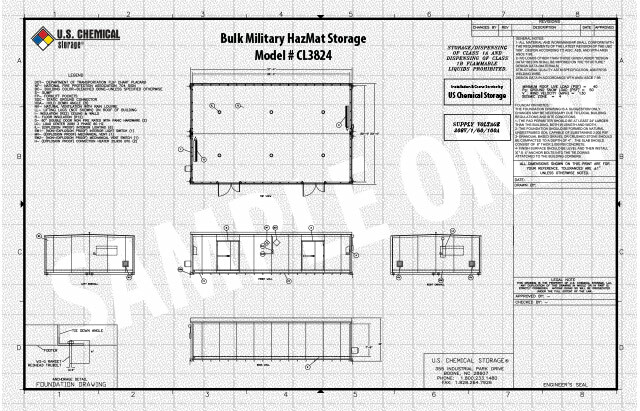 These multi-piece modular hazmat storage buildings offer a custom designed storage space with efficient and compliant heating, cooling and electrical packages. While our engineers create a solution to your chemical storage needs, heating and cooling calculations are made to properly size the units to meet your desired temperature range. When units have specific fire ratings or explosion proof design codes, particular attention is given to your building’s accessory package. 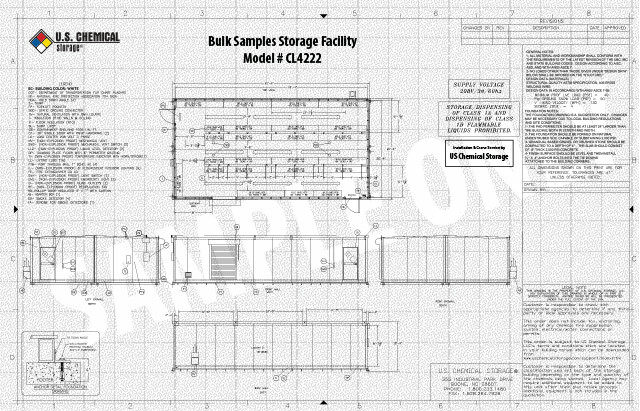 Depending on your needs and specific chemical types, 2-hour and 4-hour partition walls can be custom engineered to group and/or segregate non-compatible chemicals or specialty gases. This service guarantees the unit is compliant, eliminating additional expense after building completion. 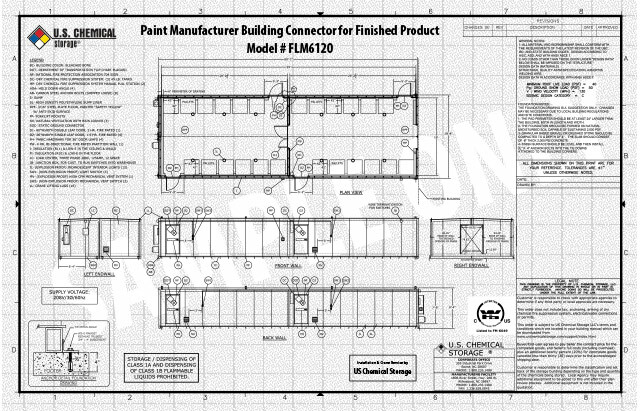 General arrangement and submittal drawings can be provided with an engineer’s seal upon request prior to submittal to the owner/end-user, architect or engineer. Third party and state approvals are available in all 50 states which makes permitting, presentations to local planning boards, and gaining fire marshal approval a simpler process. When you have a space problem, our modular chemical buildings are the answer. Backed by our 15-year structural warranty, these 100% compliant units maximize every square inch, so you get the most out of your building and investment. Two or more units are shipped to the site area, erected by means of a rigging process and bolted together. Modular construction may be utilized for any of our buildings. These durable steel constructed units can be manufactured with an insulation value of R30 or higher and offer climate control for temperatures ranging from 35°F to over 175°F, or more depending on your needs. Explosion Proof and non-explosion proof accessories are offered according to hazmat storage building codes, as well as owner requests. 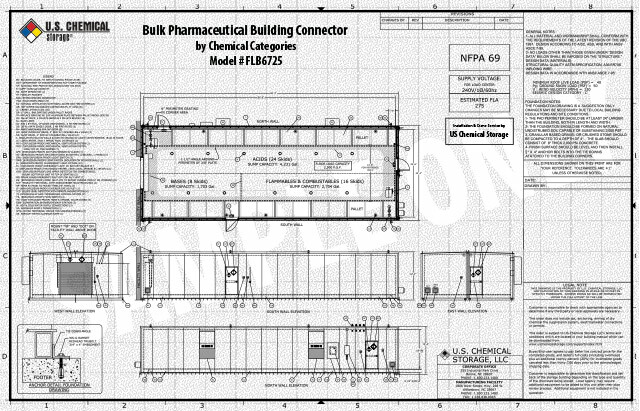 Due to transportation constraints, units are not to exceed 66’- 00” in length and 14’- 0” in width for a full building, building-half or partial building depending the configuration and design. 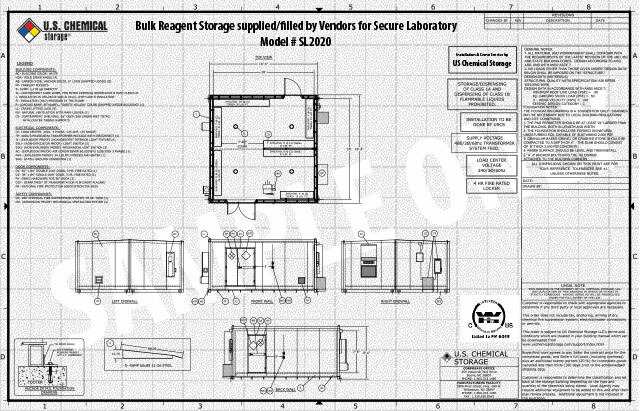 We highly advise that you utilize a modular or duplex chemical storage building when your application is over 14’ deep due to transportation constraints, structural strength and wind loading. 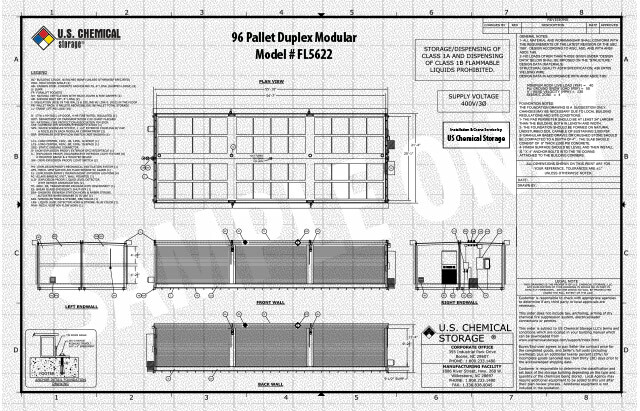 Delivery and installation of duplex modular units shall consist of US Chemical Storage, LLC providing labor to anchor the building to the customer’s foundation. The process begins with lifting the building from the trailer onto the customer’s foundation. Then the modules must be joined together and sealed with silicone caulk at all exterior joints, roof and walls. Fire caulk must be applied to all interior joints as well as on the walls and ceiling. Then the custom trim moldings must be reapplied, the sump floor caps replaced and the roof cap installed. 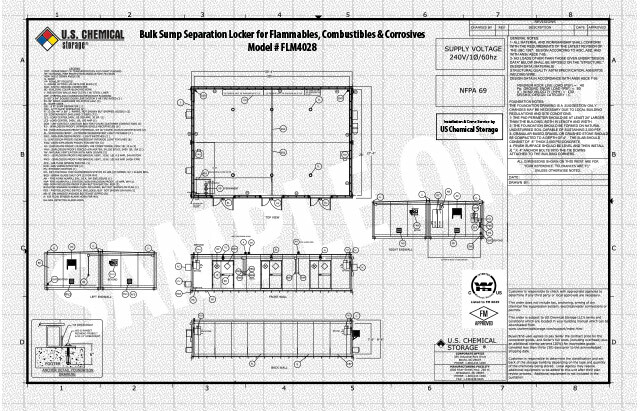 The electrical, fire suppression and alarm systems must be reconnected where they were separated at the modular joint connections for delivery. 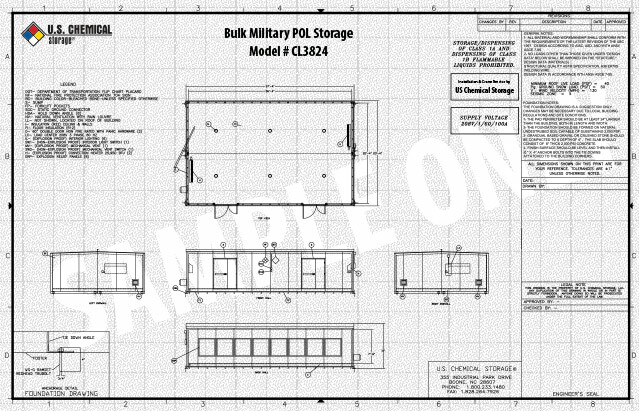 Additionally, US Chemical Storage will reinstall all outside electrical and fire suppression components that were removed for shipping purposes. 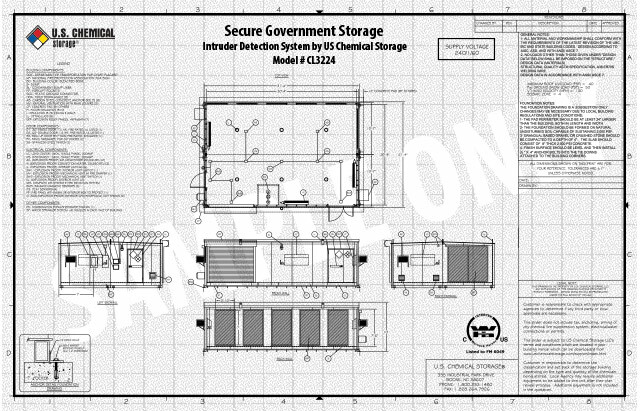 Custom modular storage buildings conform to the above design factors unless noted otherwise on drawings as directed per local and state codes. *Accessories may alter building weight and dimensions. Factory built, self contained, relocatable modular wide x long x high (including 4” high roof top crane lifting lugs), with overall building footprint of square footage. The interior shall be one whole room, wide x long x high with a total square footage of usable floor space. Interior dimensions shall have priority over exterior dimensions. Placement of the module(s) by user’s crane at site and user facility hand wiring of the electrical power supply system to the building's pre-wired entrance panel(s), interconnection of the user supplied operation mechanical (cabling, plumbing, etc.) at building prepared penetrations shall complete field installation. 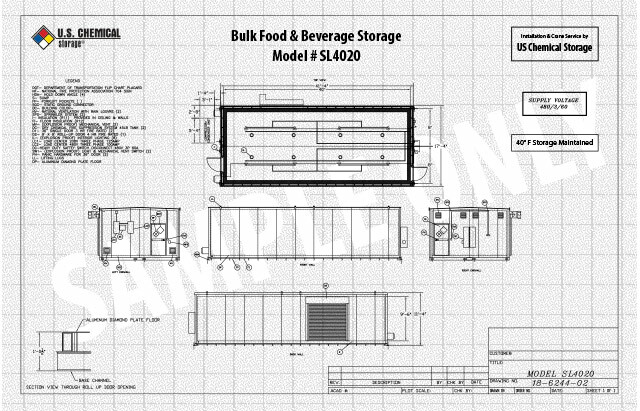 U.S. Chemical Storage, LLC as an option maybe hired to over-see all the above site installation process and hire the correct disciplines to install and provide building power, plumbing and mechanical connections. 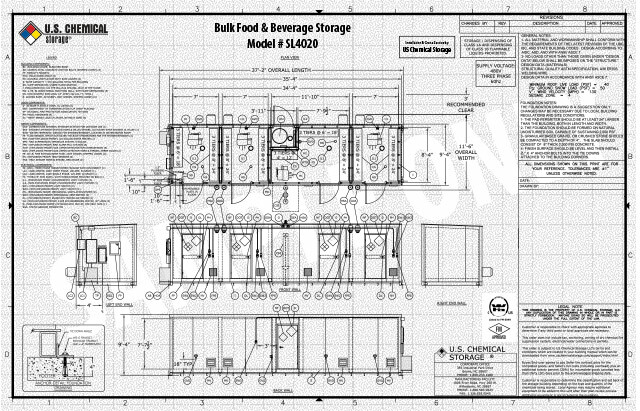 Modular building system will be applied to building(s) with manufacturing done in two (2) modular end units, each or one (x) wide x (x) long and the other (x) wide x (x) long, bolted together at the factory and shipped to customer location (or shipped separately and bolted together at the customer’s location for large multi-module building). There shall be a large structural channel or beam at the crown of the open wall of each end unit to meet all load specifications to provide a clear span the length of the building (up to 60ft). Building longer than 60ft shall have a single floor to ceiling column or post in the middle of the building. The roof and floor joints between the modules shall be covered with a 12-gauge steel cap. The buildings are secured at the floor and roof joints by tubes and/or steel angles welded to the inside wall of the two sumps with the elevated floor decking flush with the top of the modular joint cap. The finished building has the appearance of a non-modular whole building. When located more than 75’ away from other facilities, roads or property lines, fire rating is not necessary for flammable and combustible chemicals. A 30’ rule applies to corrosives and other non-flammable materials. The 75’ rule is more universally required by code but the local code authority has the jurisdiction for the ultimate requirements. 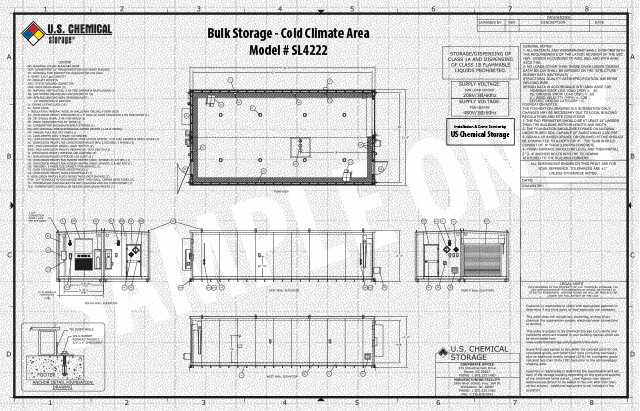 Should the building require heating or cooling systems, the walls and ceiling/roof would have to be insulated. The exposed insulation material should be covered for mechanical protection. This can be achieved by steel liner and/or gypsum board. When fire rating is required gypsum type x is used. Safely store flammable chemicals or liquids closer to or directly inside your facility with our 100% compliant and customizable 2 hour FIREloc and 4 hour SUPERloc buildings. Increase security, dampen sound, and protect hazardous chemicals closer to your facility with our insulated and 100% customizable Drop-Over buildings.